Here’s a case of strange bedfellows: the world’s first hybrid coal-solar power plant is now up and running outside Palisade, Colorado. A joint project between the utilities giant Xcel Energy and Abengoa Solar, the unit of Xcel’s Cameo plant is intended to show that solar power can reduce the environmental impact of coal-fired power plants. The plant uses parabolic trough solar collectors to heat the water that goes into the coal-fired turbine, which will reduce the amount of coal used at the facility by 2 to 3 percent. For a cost of $4.5 million, the hybrid plant will produce the equivalent of just one of 49 megawatts from solar power. It hardly sounds like a bargain to this blogger, but it’s part of the coal industry’s aggressive efforts to keep its irons in the fire as pressure mounts for cleaner energy alternatives. Indeed, several utilities have joined with the Electric Power Research Institute to study the hybrid coal-solar combination in North Carolina and New Mexico, and a solar-natural gas plant is already under construction in the Sunshine State. Abengoa has pioneered the parabolic trough solar collector, in which glass mirrors which concentrate the sun’s energy into a series of tubes filled with a heat transfer fluid — in this case, mineral oil. When the oil reaches 300°C, it is fed to an exchanger where the heat is transferred to water, bringing it nearly to boiling before it enters the boiler where a coal fire will convert it to steam, driving the turbine that generates electricity. 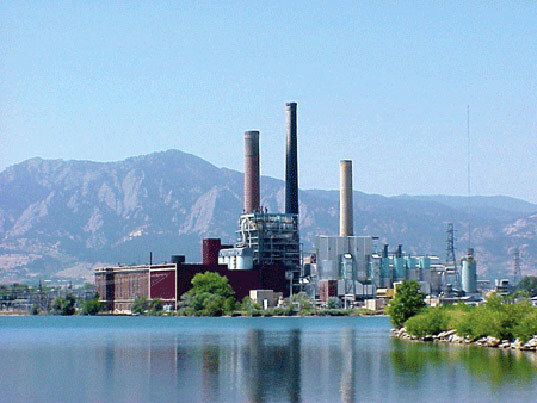 Trivial point, but the photo of the power plant is of one in Boulder, not the Cameo plant (which is a much smaller facility). --$4.5 Billion??? Check your facts, please. That's the price of a couple of new, from the ground up, power stations. The cost of the hybrid upgrade is $4.5 million. --Xcel reports that this project is a demonstration to show the feasibility of solar augmentation. 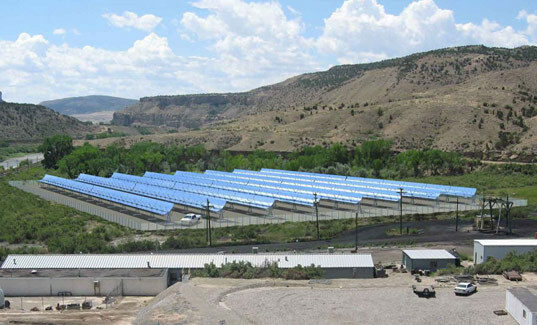 The company expects the solar power to provide a net plant efficiency increase of 3-5 percent, which will reduce coal consumption at the Cameo station by about 900 tons per year. --It's interesting to look at the efficiency of the concentrating solar troughs. The Cameo system produces the equivalent of 1.5 to 2.5 MW, or about 0.31 MW/acre and build cost of $2.25/watt. By comparison, the 2MW photovoltaic solar array at the entrance to the Denver airport cost roughly $13 million and occupies more than 7.5 acres. That converts to $6.50/watt and 0.27 MW/acre. Concentrating solar as an augmentation to existing thermal plants is an interesting and potentetially exciting step forward. What I'd like to know is of the $4.5 Billion spent on the Hybrid power plant, how much of that was for the solar system and how much for the coal system? And how much coal does the plant use? That would put the 2-3% reduction into perspective. It's hard to determine the net benefits of this type of system without clearer data. It looks like Xcel might have been better off using rooftop solar to reduce peak loads at large electricity users. By taking the funds they spent on this, and increasing the subsidy businesses already can get with tax credits, it seems that would be a more effective way to reduce peak load, which would in turn reduce the amount of coal needed in the region. This is kind of the opposite of the (now decades old) SEGS systems in the Mojave Desert. The SEGS are solar power plants supplemented by a bit of fossil fuel (their turbines can be run with natural gas at night) whereas this is basically a coal plant that is (slightly) supplemented by solar. What the SEGS systems more or less show is that there's no technical reason the solar component has to be so small. Hopefully the first and only question anyone will ask about this project is "why didn't they add more solar to it?" Here's a case of strange bedfellows: the world's first hybrid coal-solar power plant is now up and running outside Palisade, Colorado. A joint project between the utilities giant Xcel Energy and Abengoa Solar, the unit of Xcel's Cameo plant is intended to show that solar power can reduce the environmental impact of coal-fired power plants.